Ballinger hit the jackpot this evening and will be rewarded with a cold night. The outage on the county line was caused by a tree coming down on the line and blowing the transformer. Another of those spectacular booms and flames shooting into the sky. 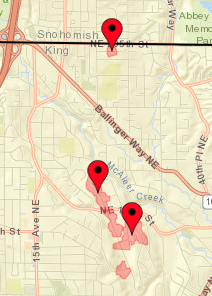 The other two outages on the map were caused by a car taking down a utility pole. Anyone able to take a photo out their window? Power is not expected to be restored before early morning.